Annual trade between China and Africa is now worth more than $100bn (£63bn). Chinese companies are active across Africa, but have been criticised by some in the West, who accuse Beijing of failing to promote good governance. Chinese firms, many of them state-owned, regularly bid for major construction projects at costs which Western firms cannot match. In addition, Beijing also operates a policy of non-interference in domestic affairs. That has allowed China to do business in areas of Africa, such as Sudan, where Western firms are constrained by human rights concerns. Speaking to a German newspaper, Mr Kagame - seen in the West as one of Africa's more dynamic leaders - was as critical of the West as he was generous in praise of China. 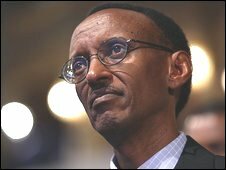 "Western firms have to a large extent polluted Africa and they are still doing it," Mr Kagame said. Although Rwanda received substantial international aid in the wake of the 1994 genocide, which left more than 800,000 dead, Mr Kagame told Handelsblatt that relations based more on trade than aid were now the most useful to Africa. "I would prefer the Western world to invest in Africa rather than handing out development aid," he said. "There is a need for help - but it should be implemented in such a way as to enable trade and build up companies." The Rwandan leader also said that high trade tariffs prevented African producers from gaining equitable access to global markets. "It would help Africa much more if industrialised countries allowed us the same trade rights as they give to each other," Mr Kagame said.